Well, what can I say about this cake?! 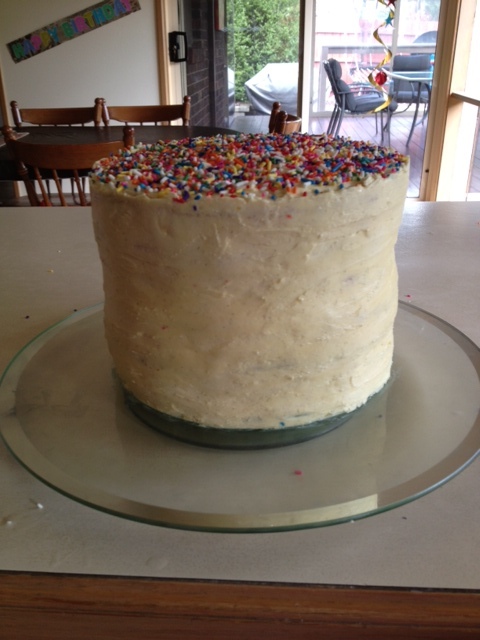 7 layers of delicious vanilla bean cake and buttercream, it probably could of fed about 100 people, no joke. This mountain was made for my beautiful little sister’s 8th birthday, and it certainly got the reaction I was after! The gasp from my sister and her little friends (and the adults too!) was priceless, and it’s what makes the hours of slaving away in the kitchen well worth it! I hope you enjoy the gif too, it’s not the best, but I think this epic cake deserves it. I found this recipe from my bible website, Taste.com.au. Even though I have posted the link, I am going to write out this recipe as well because I have a few notes and helpful hints that will make life a little easier. 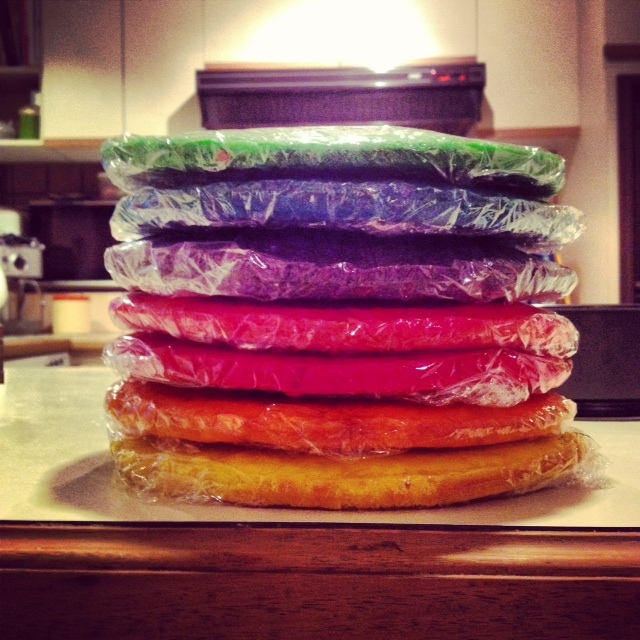 Food colouring gel – I used Wilton’s as they are very concentrated and achieve an amazingly bright colour. I buy mine from West’s. If you are not icing the cake straight away, refrigerate them. I made my cakes 2 days in advance and it was perfect. Just make sure to remove cakes from fridge 1-2 hours before decorating. 2 tsp vanilla bean paste/vanilla extract – NO imitation vanilla allowed!! It is full of chemicals and artifical flavours. In the bowl of a stand mixer, or if you don’t have a stand mixer, a very large bowl, beat butter until pale and creamy, about 5-7 minutes. Gradually add the icing sugar and vanilla to taste (I used between 3-4 cups – I actually can’t remember the exact amount! Although you want it to be nice and sweet, you also still want that slightly salty hit that comes from the butter). Beat on high for about 8-10 minutes. 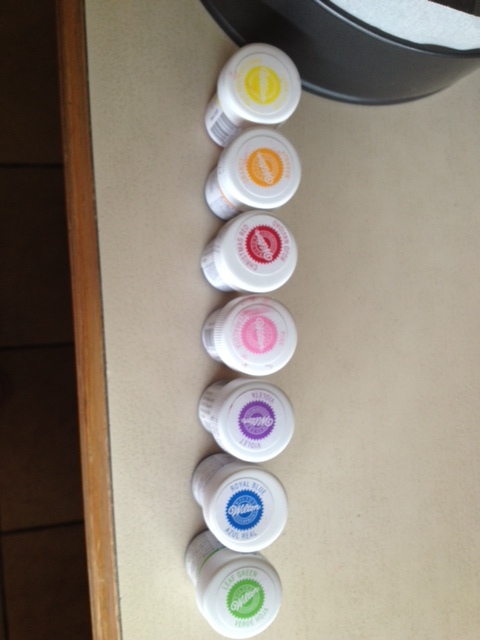 If you are not icing the cake straight away, place buttercream into an airtight container, in the fridge. Buttercream keeps really well, up to 2 weeks in the fridge, and 6 months in the freezer. Just make sure that you take the buttercream out of the fridge or freezer the night before you ice the cake, so it can come down to room temperature. I had mine in the fridge, and the next morning it still needed 10 seconds in the microwave. TIP – when putting buttercream in microwave, do it in small bursts as you do not want it to become runny. You want it to be pliable, but still have its thickness and creamy texture. 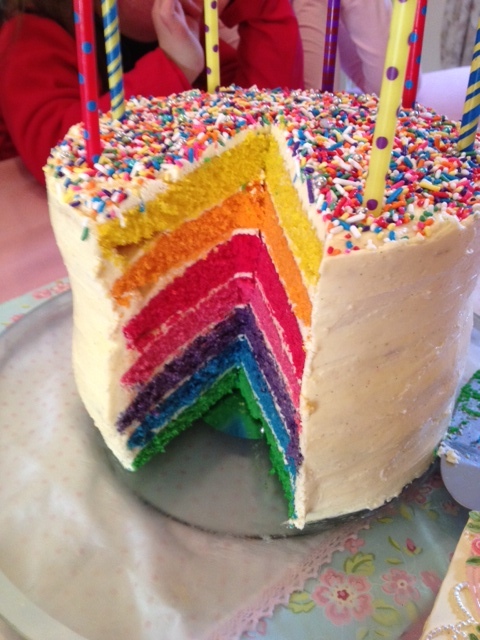 Once cakes have come down to room temperature, you can start building. You will need a round-edged knife, and a small bowl of hot water to smooth the icing. Unfortunately, our round-edged knife is broken, so I had to use really small cheese knives! 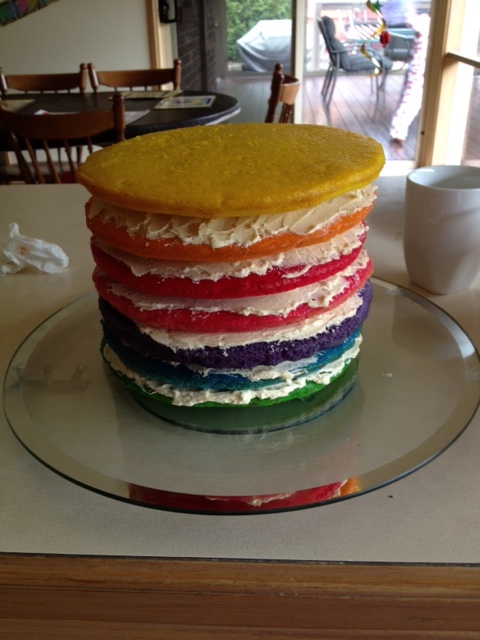 Place the bottom layer of cake on the stand, and top with about 2 tablespoons of buttercream. With the knife dipped in hot water, smooth out the icing until it covers the circumference of the cake, and is about 1-2cm thick. Repeat the process with the remaining 6 cakes. 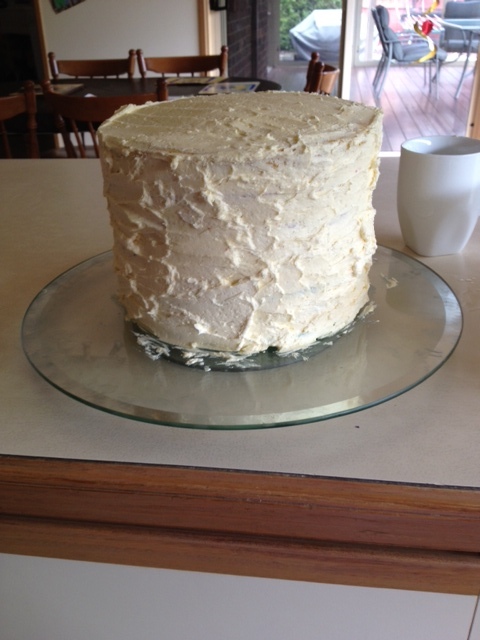 To ice the outside, make sure you keep dipping the knife in hot water, to cover the whole cake with buttercream. For now, don’t worry about smoothing out the icing, you just want to get the cake covered first. To clean up the icing, ensure the knife is dipped in the hot water regularly. Carefully smooth the icing with the round-edged knife. 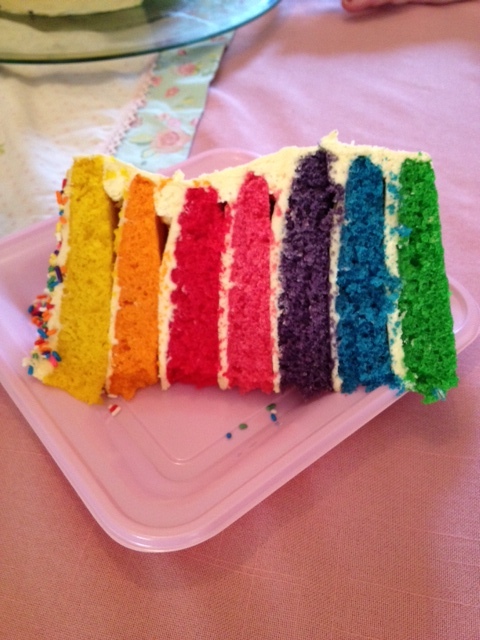 As the cake was so colourful and intense in the middle, I wanted to keep the decoration on the outside to a minimum. 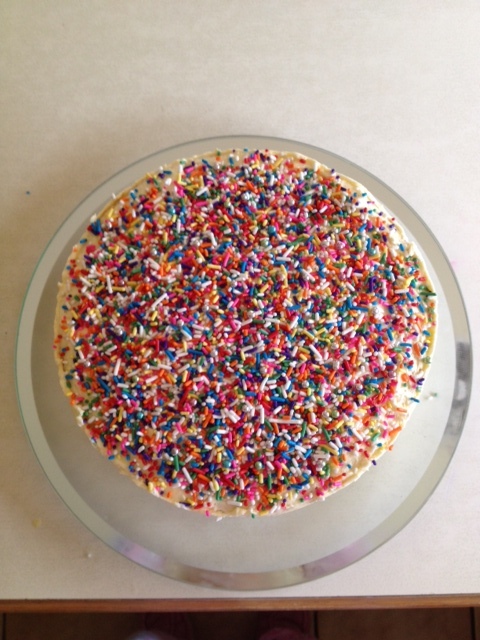 I had bought these brightly coloured sprinkles from Baking Pleasures, and they had every colour I wanted to have in the layers, so I decided I would completely cover the top of the cake in these sprinkles, and leave the rest of the cake. I was pretty happy with how it looked. 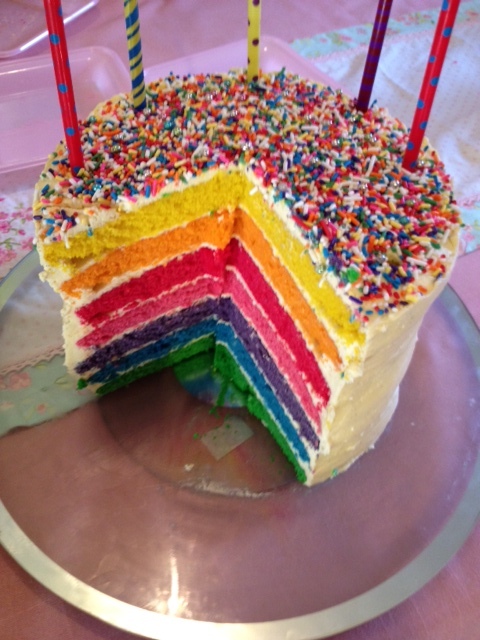 There are many ways you could decorate a cake such as this. 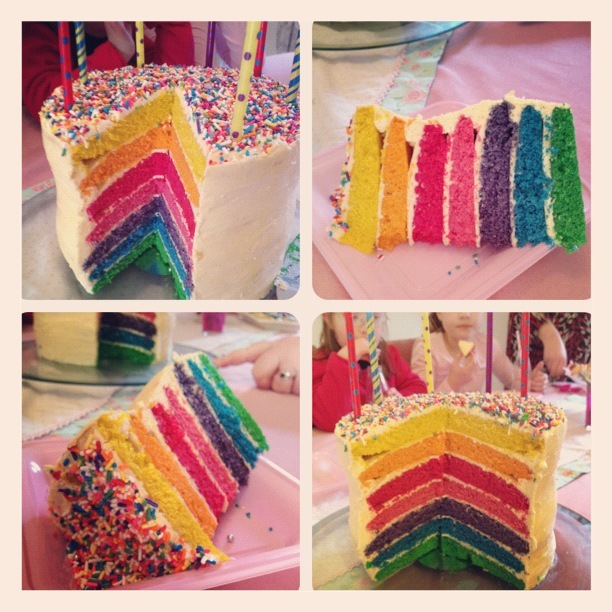 I love these gorgeous Rainbow Cakes from Sweetapolita and Whisk Kid. Why make my cake turn very densed. It looks too much flour in the recipe?